There is a common scam car buyers need to be aware of, largely because the best solution to is to not fall for it. Kind of like telling you the best cure for a particular illness is to not get sick. It’s called Curbstoning and it happens every day to naïve car buyers. Says the transaction needs to take place at a local dealer where a “friend” of his has agreed to help with the “paperwork” for this transaction. These kinds of shady deals are all referred to as Curbstone deals. I have personally spoken with many people who have been taken in by deals like this. They usually are being done by people who are dealers pretending to not be dealers or by people who are not dealers but ought to be because they sell too many cars. 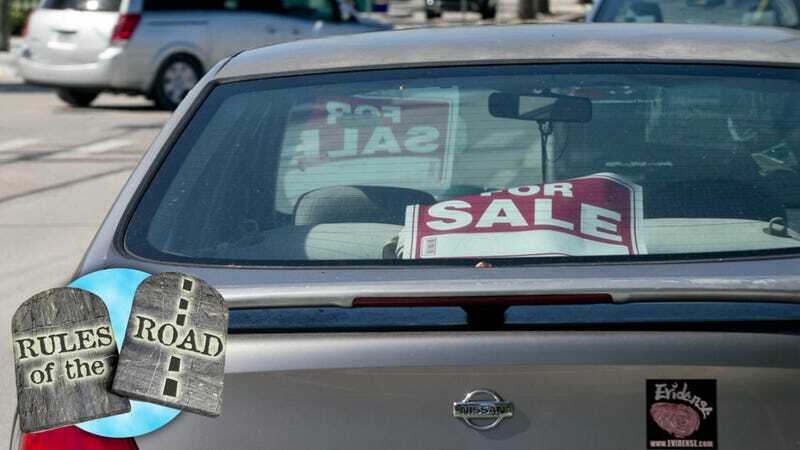 In Michigan, if you sell five or more cars in a year, you are required to get a dealer’s license from the state. Similar laws exist in other states. But, many people don’t bother to get licensed. Background checks can be hard to pass because of a felonious past, or maybe they don’t want to pay the small-business-crushing $75 fee. The problem is that the state rarely - if ever - enforces this rule. As a result, non-dealers sell cars all day long from the curbside, the local parking lot, or wherever else they can park a car. Often, they “skip” the title by not recording their own name in the chain - signing the title from the person they bought the car from over to you directly. The upshot of this is it looks as if you bought the car from their seller and the curbstoner manages to stay off the radar. Some might wonder why an actual dealer would try and sell a car from in front of a house rather from the comfort of their own cramped lot on Eight Mile. Most people feel a little better about a prospective car purchase if they believe they are talking to an actual owner of the car who has spent time living with it rather than just a salesman trying to sell a car he knows nothing about. Many people would come haggle in a front yard long before they’d willingly step inside the twelve square-foot salesroom of “Bob’s A-1 Car Shack.” All else being equal, most people would consider the regular-owner car to be worth more than the curbstoned dealer car. Strangely enough, curbstoning in Michigan is not illegal in and of itself when done by a licensed dealer. The law says that a dealer must conduct “a large share” of its business at its location - implying that it is allowed to conduct a lesser share of its business elsewhere. Where the transaction gets murky is whether the dealer-seller is truthful and so on about the reason the business is taking place in front of a residence in Ferndale, rather than at the dealership on the other side of Eight Mile in Detroit. Again, laws vary from state to state but this appears to be how it is in many states: the few laws that cover this are rarely enforced. And because of the large amount of gray in the various areas of the transaction, it is simply better if you avoid the transaction altogether. When you find out that Craigslist has led you down a bad path, walk away. I know, it shatters your world view to believe that a total stranger might try to mislead you for profit on the internet. It’s time you found out the hard way: the internet can be that way.